Not My Job: Paula Deen Chef Paula Deen plays our game called "It's colorless, flavorless, vaguely slimy ... and yumma-RIFF-ic!" Three questions for the Queen of Southern Cuisine about tofu. 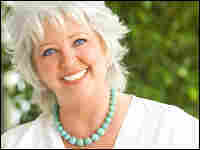 Chef Paula Deen plays our game called "It's colorless, flavorless, vaguely slimy ... and yumma-RIFF-ic!" Three questions for the Queen of Southern Cuisine about tofu.